In just a few days, I will be on my way to New York City for an unforgettable weekend. Weardrobe (if you haven’t signed up, go do it!) 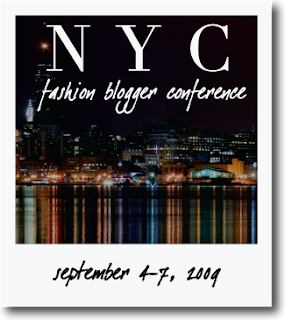 is hosting a conference dedicated to fashion blogging. Nineteen bloggers will be in attendance including some of my absolute favorites. I feel honored and humbled to be a part of this experience. More than anything, I’m incredibly excited to meet my fellow bloggers face to face. Some are new to me, and some I feel I already know through their daily pictures and words. All of them are so talented! I will be documenting my trip every step of the way, so stay tuned for some exciting material in the near future! Also, click here for a list of all the featured bloggers and more details about the conference. Yay! I am so happy for you :) You deserve it! I can't wait to see your pics!! So exciting! Can't wait to see all of you documenting this awesome experience!